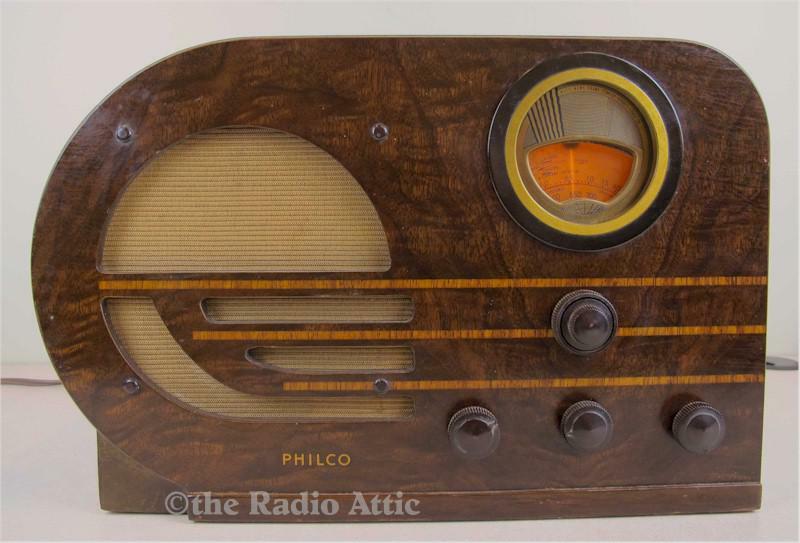 The Philco "Bullet" radio is an iconic design offered when wood cabinet radios featured their most glorious styling. Everyone was fascinated with the streamlined designs of automobiles, airplanes and locomotives, so it was only natural to find that styling cue in radios as well. This example has an outstanding cabinet that has one flaw on the top. There is an area of finish loss where someone likely had a small flowerpot that was overfilled with water. It's not uncommon to see this on antique radios. The remainder of the cabinet, including the faux finish front, is excellent. A prior owner restored the chassis and it is a wonderful performer. It weighs 18 pounds; 16-3/4"W x 11"H x 9-1/4"D.